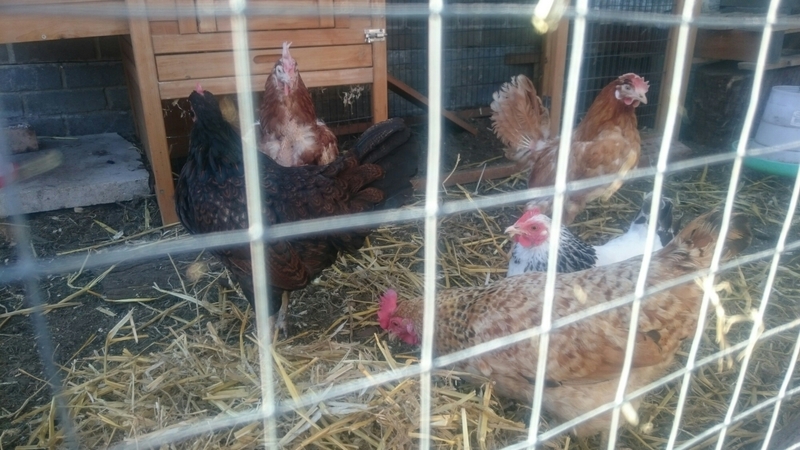 We recently collected 2 ex-battery rescue hens from our local RSPCA centre. They referred to them as “oven-ready” due to their lack of feathers. We new they’d be in poor shape, but had no idea how fragile they would be. For example, we were told not to let them jump until their legs strengthen as they’ve never had to use them. And that they have no concept of night and day, so we’ll have to teach them to go to bed. Basically, they have no idea how to be chickens. This surprised and saddened me to think how they have been living, and I urge everyone to stop buying eggs from caged hens. Introducing them to our current 3 girls has been tricky. It turns out our posh girls are a bit mean and they’re picking on them. To be fair, they’re establishing the pecking order. However, one of the new oven readies is taking a battering and has a nasty cut on her back. We’ve sprayed it purple, but that hasn’t stopped them pecking it, so we had to quarantine her until she builds up her strength. Rehoming battery hens is a nice thing to do, but certainly not as easy as I thought it would be. Luckily, after two weeks, they’re all getting along now. There’s still an ‘us and them’ divide, but they’re not being mean anymore. The oven-ready hens seem so happy and grateful, I think we’ve done a good thing.